Art | Experience New Orleans! 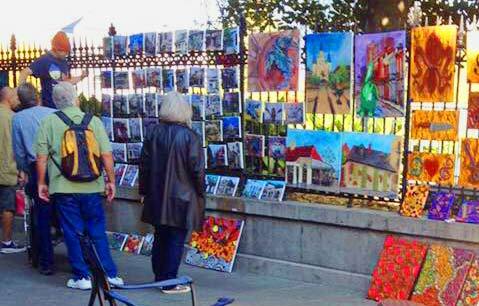 New Orleans has always beckoned to artists. Edgar Degas painted The Cotton Exchange here in 1872. World-famous Newcomb Pottery grew out of the pottery program at the women's college now associated with Tulane University. And local artists like George Rodrique with his Blue Dogs, Michalopoulos with his slanty houses, and Dr. Bob with his “Be Nice or Leave” paintings have been offering visitors a little bit of New Orleans to take home with them for years. Wherever you go in New Orleans, there’s art. Here are some key places to find it. There are at least 16 galleries in the Arts/Warehouse District, a.k.a. “the Soho of the South.” Learn more here. More than a dozen art galleries can be found on Magazine Street, five-miles of funky shops, fun restaurants and trendy coffee shops Uptown. Learn more about Magazine Street galleries here. One of the top art museums in the South, NOMA hosts a permanent collection of almost 40,000 objects. It is noted for its impressive collection of American and French art, photography, glass, and African and Japanese works. Learn more here. With over 60 priceless sculptures on five acres, the Besthoff Sculpture Garden is a true New Orleans treasure ­– and admission is FREE! Learn more here. Odgen Museum of Southern Art, 925 Camp St. The Ogden, an Affiliate of the Smithsonian Institution, is home to the largest collection of Southern art in the world, showcasing art from 15 Southern states and the District of Columbia. Learn more here. The Contemporary Arts Center (CAC), 900 Camp St. The CAC houses world-class exhibitions and hosts shows and educational year-round. Discover 30,000 square feet of bold experiments in studio and performing arts. Learn more here. The George & Leah McKenna Museum of African American Art collects, exhibits, and preserves the visual aesthetic of people of the African Diaspora. Come discover the private collection of Dr. Dwight McKenna. Learn more here. Algiers Folk Art Zone and Blues Museum, 207 Leboeuf St. The Algiers Folk Art Zone was opened in 2000 by self-taught artist Charles Gillam. You’ll find works by Roy Ferdinand, Lonnie Holey and Mr. Imagination along with Gillam’s “Blues Greats” series featuring the sculpted faces of Al Hirt, Pete Fountain, and Clarence “Gatemouth” Brown and more. Learn more here. This outpost, a former auto garage, hosts performance art, live graffiti and art exhibits on the third Saturday of every month. Want more info? Call 504-717-0750. New Orleans is home to several open-air markets. Click on the names of the markets below to learn more. Visual artist and photographer Lee Tucker has exhibited in galleries in the U.S. and England. He has had numerous one-man shows, including an exhibit at Chicago’s prestigious Steppenwolf Theater, in tandem with the venue's production of "A Streetcar Named Desire." Carol Zehner’s art captures the classic scenery of New Orleans and the Deep South on note cards, Christmas cards, and lithographs. Zehner works in pen and ink to give detail and texture to her work, later adding watercolor to enhance the emotion of the artwork.